All my adult life, I've been employed in offices where perfume was adored by my co-workers. (Yes, my passion for fragrance sometimes fueled this interest.) As I wore new perfumes each day, stocked up on samples of rare and unusual and hard-to-find colognes, almost everyone in my office wanted to smell what I was wearing, give me their on-the-spot reviews, serve as “second-skin” guinea pigs, and enjoy all the samples I gave them. That atmosphere vanished last winter when I began working in a place where few people wore perfume (and nobody had any interest in it). Though there was not a "no-perfume" office policy, I immediately started wearing light, citrus-y perfumes at work, perfumes that didn't extend their reach far beyond my person. I've been preparing for summer by making a list of possible new perfume candidates for office-friendly wear. Hermès Terre d'Hermès Eau Très Fraîche shot to the top of my list. I like original Terre d'Hermès (2006), but I've never bought a bottle…though I've come pretty close. 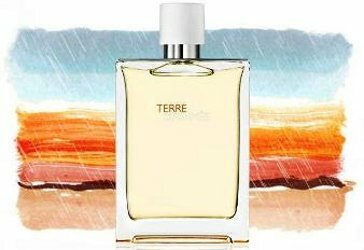 Terre d'Hermès Eau Très Fraîche, a new version of Terre d'Hermès, was developed by perfumer Jean Claude Ellena and it just hit the stores. Described by Hermès as “a dialogue between bitter orange and woody notes and a clash between the solidity of earth and the freedom of citrus” I immediately got a visual image: an orange tree, dust swirling around its trunk, leaves and ripe fruit fluttering and jiggling in a strong wind; a scent blend of earthy and fruity notes. Terre d'Hermès Eau Très Fraîche and Terre d'Hermès share a similarity in their base notes (a smooth, sheer blend of residual bitter orange, cedar, and, perhaps, some vetiver) but their openings differ: Terre d'Hermès Eau Très Fraîche has a more vibrant start — a gust of bitter orange peel, with a definite “sweaty” vibe. (Terre d'Hermès' opening also has orange, but it’s more opaque and milder). Unfortunately, what came to mind immediately when I sniffed Terre d'Hermès Eau Très Fraîche were two perfumes, similar in character, that I like better: the powerhouse citrus Parfum d’Empire Yuzu Fou and the delicious, spicy, funky (used to hate it, now love it) Frédéric Malle Cologne Bigarade / Bigarade Concentrée (also by Ellena) — both these perfumes have more oomph and personality and lasting power than Terre d'Hermès Eau Très Fraîche. Of course, if your hope is to tone down the "personality" of those type citrus fragrances, to make them more well-mannered, then Terre d'Hermès Eau Très Fraîche may make you smile…and buy. Me? I like Terre d'Hermès Eau Très Fraîche, but I prefer jagged-edged citrus. Terre d'Hermès Eau Très Fraîche has good (close-to-the-skin) lasting power, and minor sillage (and would be perfect for office, airplane, theater settings). If you own original Terre d'Hermès, I don’t see why you'd need or want Terre d'Hermès Eau Très Fraîche (unless you desire a lighter version). As for my office perfume predicament: I've bid adieu to the (almost) scentless company. At my next gig, if they're interested, I'm ready for the “training and development” of a whole new bunch of office mates in the pleasures of fragrance. Hermès Terre d'Hermès Eau Très Fraîche is available in 125 ml Eau de Toilette, $115. Sabrina: it probably has a more risque meaning than I intended! HA! Where I worked, which was a campus setting with about 15 office buildings and nearly 2,000 employees onsite, we had a fairly rigid safety and health program (due to the nature of the project and dealing with nuclear waste). As such, I had been involved with an accident investigation because a co-worker fell ill and had to be taken, by ambulance, to the hospital up the street after having an allergic reaction to somebody in a neighboring cubicle wearing Acqua Di Gio. “Yeah, that sounds about right”, our S&H manager replied. Bark…haha! plus, many other conditions came to mind reading your description of the symptoms! I actually did move on from a job once, many years ago, when they instituted a no-fragrance policy. I didn’t walk out in a huff or anything so dramatic, but I did go back to my desk, make copies of my resume, and start job searching that same week. Teri: it would be hard to stop wearing scent “cold turkey”…but I guess I could learn to do it if I LOVED my job…I would simply make all non-working hours a perfume-o-rama! I have a friend of 20 years’ standing who lives just outside Houston, Texas (I live in the north of Scotland); her preferred fragrance when we first met was Giorgio (dreadful stuff!) but she worked in an office where strong perfumes were frowned upon. On one visit many years ago I took her the Penhaligon’s Fragrance Library for Women, which she was able to use with no complaints. She is not the only American friend I have given this set to. In recent years, when Ormonde Jayne had a fantastic offer of free worldwide postage on their ‘discovery set’ I sent her it – again no problem at work. Perhaps UK fragrances are just gentler. This thought just popped into my head – had a friend in the 1970s who wore Tabu by Dana – suited her, but was a tad potent – our group nicknamed it “instant brothel”! Just bought a bottle of Tabu I found at a Goodwill. Haven’t been brave enough to wear it, yet, but “instant brothel” might encourage me! MR: DO paint a beauty mark on your cheek before venturing out in Tabu (and yes, I mean your FACIAL cheek…knowing your cheeky nature had to cut you off at the pass)! Glad I could be of assistance! Said friend is sadly no longer with us, but my best friend was also a friend of hers, so will tell her about this chat next time I see her, she’ll appreciate it for sure. Carolyn: hmmmmm…Penhaligon’s, Jo Malone, Czech & Speake…O. Jayne…I guess there’s not a true “powerhouse” in the collections? Or simply none of those are overtly “artificial smelling”? Kevin, as I recently said to Robin, I really appreciate the fact that you respond to people’s comments & add any extra bits of knowledge you have on the topic in hand, so thank you. I don’t count Jo Malone as British, given it’s an Estee Lauder company, although Jo’s new company “Jo Loves” is another matter entirely! I think you’re right on both counts – no ‘powerhouse’ smells in the Poison, Angel, Youth Dew, Giorgio league, but also not so many artificial ingredients, or certainly not artificial smelling, in British fragrances. I like the original but find it a bit blunt or strident. Those are not terms we usually associate with Ellena, I know; maybe it’s just that some of the woody synthetics strike my nose harder than his. I’m curious to try this revised version, as well as Bel Ami Vetiver. Noz: and these are very “smooth” to my nose…nothing strident. Hope you get to try Bel Ami Vetiver soon! I’v been pairing up Concentree Orange Verte with Terre d’Hermes, and the effect is…awesome! But, I love them both on their own as well. Merlin…I will have to try that! I really wanted to like this, and was hoping that you were wrong, Kevin, but you weren’t. It’s dreadfully boring. It’s made well, but who cares. It’s been done before and better. This rendition adds nothing to its original or its genre. Eau Très Soporifique.